With hundreds of thousands of downloads during President’s Day weekend, our latest game, Adventure Time: Card Wars, has reached #1 in paid Apps in 29 countries! And our friends at Nickelodeon should be happy to see that the KFF developed Spongebob Moves In iOS game is currently at #7! 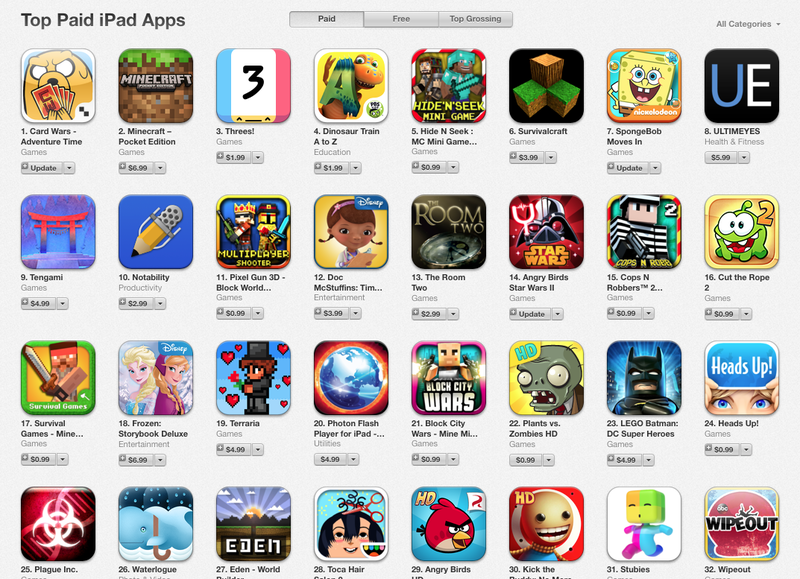 We couldn’t be more proud to have two Kung Fu Factory developed games in the Top 10 at the same time! Two Games in Top 10! I paid money to play this game but still there’s ad? Really……. Hopefully this was CN’s call and not yours. It makes for a terrible user experience. The most frustrating thing about it is you’ve built a genuinely fun game, but it’s been soured to the point of un-enjoyable with the rediculas amount of IAP requirements. Are you running out of hearts? The latest version of the game has been tuned so that you earn hearts with each quest you clear. We can talk to the team about adjusting it more. Can you please let us know what level you are on? I just wish there’s another way to get Powerful cards (3-5 stars) without having to buy gems that are so expensive. It actually gets better because you guys have dropped the price and dropped the amount of gems. And pleasee! Multiplayer! So we can interact with other players! Duel them and trade even. That’d be so awesome! Love the game, good work! Congrats on the #1 spot! Honestly, the hearts are not a big issue as long as you don’t play for hours nonstop. Usually, by the time I finish a game, the hearts I used to start it are almost fully recharged. Just one question: do you guys plan on adding multiplayer at some point? I would love to try my decks against some human opponents to see how they fair. Thanks for the game, and keep up the good work! Glad you are enjoying the game Anton. We have some big new features coming in June. Stay tuned!! I loved this game even stung out on extra gems for it until the latest update. Now I can’t even open the game, crashes every time I try to boot it up. Hey Liam, what type of device are you playing on? We have an update coming soon to address some issues. This game deserves first place. My only problem is the programming. The game is constantly crashing, especially during fights. At least one out of ten matches is a crash. And each time counts as a loss. So no exp and a waste of hearts. Please fix these bugs. Hey Richard, what type of device are you playing on? We’ll want to make absolutely sure you have a good experience going forward. It’s a iPhone 3. I can understand the glitches of I’m not using the right device. Verizon sent a update to my phone today. So happy to hear that this fixed it. We’ll investigate Android version 4.1.2 further. Congrats on the accomplishment! You guys have created a great game despite some IAP woes, I can’t tell enough people abouthow much I love this game. What I am bummed about is getting 3 stars on all the levels only to read that other devices have a newer version than I can have so I’m missing out on more fun against peppermint butler and so on. Is there any hope of seeing an updated version for the kindle fire HD? I can only seem to download version 1.0.4 from the amazon appstore and I so deperately want to play more. Congrats again! Thanks for the kind words Big Daddy. The Kindle version 1.0.7 should be out any day now. Please stay tuned!! Hi i have a Sony Xperia L android 4.2.2, and my card wars game is broken, when i launch, appears trial version in the coner and when play launch, um map stay in the midle of screen and the battle whell dont work. All this happen before update. Can you guys look for this? Thanks for the head’s up Gabriel. We hope to have an update for you on the Google Play store by Friday night June 13th. Placed #6 and didnt get gold card. It says 2-10 get gold card. You can’t have a 2 week tournament and then not pay out the prize. My game name is RICH. I’ll be waiting. Hi Rich, we just fixed a bug so hopefully the next tournament will be to your liking. Stay tuned! First of all, great game I love it! 1- As someone already said, it’s very bad that this a a PAID app but you also have to PAY in order to play more than 10-30min in a row and even worse in order to be able to stack up more cards! You also got a card storage limit where you have to pay to be able to have more cards. In my opinion at least you should remove the card limit because paying 1 gem for 5 extra card slots is insane since you can get 3 new cards each battle… Please at least remove the “card storage” limit since in my opinion it’s very bad for us. 2- Regarding the previous point, make this a free app and charge for stuff inside it or make this a paid app but don’t charge for stuff inside (unless it’s dlc). Charging for both is a real turn off for many people and I can’t get my friends to play this because of this. 3- At least in Mexico store 50 gem pack are at like $360 pesos which is like 30 dollars. 50 gems gets you 16 cards from good chests. Come on, not even physical Yu-gi-Oh or Magic card boosters are that expensive and they come in packs of 9 cards for 3dls. I’ve been very tempted to buy gems but for that price it’s a no. And I’m not even mentioning that those 16 cards are random and you could get something somewhat useless. Thanks for taking the time to read my suggestions! Thanks for the feedback Daniel. We don’t control the Gem pricing. So that sounds like it’s a mistake. Cartoon Network needs to make that adjustment for us. Anyways, big changes are coming for this game in the next few months. Stay tuned!! Previous Post: Adventure Time Card Wars Released Today! Next Post: More to Come!